All bars that we offer you are equiped with a universal safety system, they can fit barely all brands. *(contact us for fittings). The female or male conections at the end of the lines can be adapted to fit your kite . Then an in flight setup might be needed but our team will take a pleasure to explain you the principe. 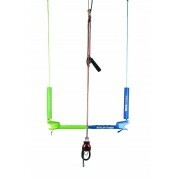 You dont have to buy one bar per kite , one bar can fit all your quiever ! Save money ! The most versatile bar on the market combining multi functionality with streamlined performance. Reduced diameter ultra skinny grip. Bombproof build, incredible attention to detail and reliability.